ˇOh, and make money too . . . Sound crazy? It's all standard operating procedure at Zappos, the online retailer that's doing over $1 billion in gross merchandise sales annually. 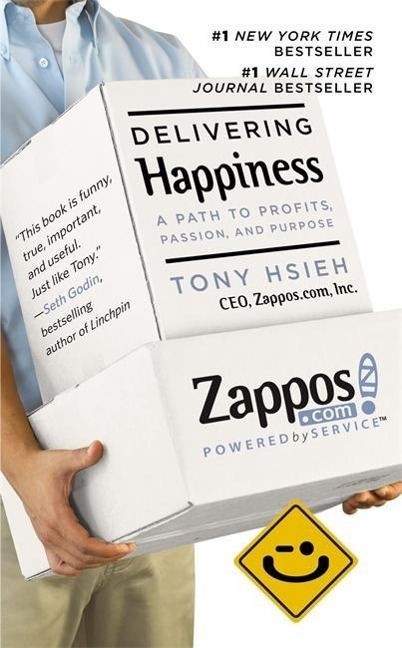 After debuting as the highest-ranking newcomer in Fortune magazine's annual "Best Companies to Work For" list in 2009, Zappos was acquired by Amazon in a deal valued at over $1.2 billion on the day of closing.In DELIVERING HAPPINESS, Zappos CEO Tony Hsieh shares the different lessons he has learned in business and life, from starting a worm farm to running a pizza business, through LinkExchange, Zappos, and more. Fast-paced and down-to-earth, DELIVERING HAPPINESS shows how a very different kind of corporate culture is a powerful model for achieving success-and how by concentrating on the happiness of those around you, you can dramatically increase your own.